An erudite work on tectonic resurgence in Late Quaternary time of the Indian subcontinent embracing India, Pakistan, Nepal, Bhutan, and Bangladesh, Neotectonism in the Indian Subcontinent dwells on the causes and consequences of tectonic events that fashioned the landscape of a land characterized by a fragmented framework. The narratives on the structural and geomorphic developments during the morphogenic phase of the geodynamic history of the Indian subcontinent explain many phenomena. These include the tremendous height and spectacular structural-geomorphic architecture of the Himalaya, and the behaviour of wayward rivers in the sinking and rising Indo-Gangetic Plains. In addition are the shifting, deflection, piracy, and even disappearance of rivers and streams in the dry desertic terrane of western India, as well as the unique drainage pattern of the ruptured and rifted plateaus and coastal belts of Peninsular India. The formation of huge lakes due to river ponding in the stable continental shield in Karnataka is also explained. All of these phenomena are accompanied by profuse illustrations. 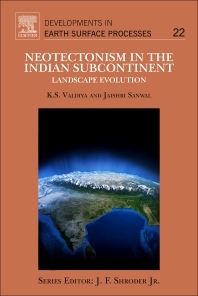 Neotectonism in the Indian Subcontinent portrays the evolution of the extraordinary landforms and landscapes of the subcontinent, constituted by multiple terranes of contrasted lithostructural architecture and distinctive geomorphic layout—each with an altogether different geological history. It chronicles events of crustal unrest or tectonic turmoil manifested as displacement, subsidence, and uplift of the ground with bizarre drainage changes and episodic seismicity. This book caters to planners, engineers, and hazard managers, but also satisfies the curiosity of those who are interested in understanding the formation of the Indian subcontinent. Professor K.S. Valdiya is Honorary Professor of Geodynamics at Jawaharlal Nehru Centre for Advanced Scientific Research. He has held high positions as Additional Director in Wadia Institute of Himalayan Geology, as Professor of Geology, Dean Science and Vice-Chancellor in Kumaun University, as Professor of Geodynamics (1995–1997) and Bhatnagar Research Professor (1997–2002) at the Jawaharlal Nehru Centre for Advanced Scientific Research, Bangaluru, Golden Jubilee Research Professor of Indian National Science Academy at Jawaharlal Nehru Centre for Advanced Scientific Research. Distinguished Guest Professor at Indian Institute of Technology, Mumbai and Visiting Honorary Professor at the Indian Institute of Technology, Roorkee. He is the recipient of many national awards, including the 2009 L.N. Kailasam Gold Medal and the 2000 Prince Mukkaram Jah Gold Medal of the Indian Geophysical Union and the 1980 L. Rama Rao Gold Medal of the Geological Society of India. His fields of specialization are tectonics with special reference to active faults, and environmental geology, and he has written many books and research papers on these topics. Dr. Jaishri Sanwal is Research Scientist and Principal Investigator for the Geodynamics Unit at Jawaharlal Nehru Centre for Advanced Scientific Research. She has been granted several fellowships and specializes in tectonics with special reference to active faults and paleoclimatic changes. Thirteen years of experience of working in the field on active tectonics in the central and western sectors of the Himalayan Mountain including Ladakh and Kashmir.